Though often marketed as a pure green tea, Genmaicha is actually a blend made from Bancha green tea and rice. The name “Genmaicha” translates to “brown rice tea”, likely due to the color of the added dried rice. 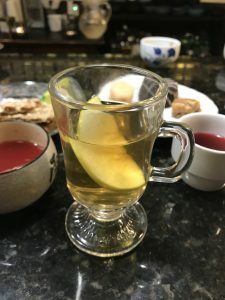 Relatively new by the history of tea, it was created in the 1920’s by a Kyoto merchant who was trying to sell some Bancha tea that was moving slowly through his inventory. Upon invention, its popularity soared among the working class and became known to the masses as a “peasant” drink. Combining tea with the common commodity of rice created a less expensive alternative to pure teas and was a creative way for people to stretch their tea dollars. In more recent years, however, it has gained popularity in all classes. 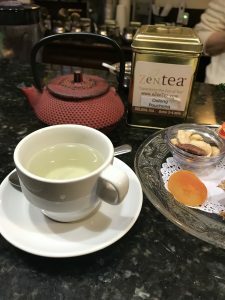 Genmaicha remains a popular drink among those fasting or individuals who go a long time between meals, as the rice gives a thicker body to the tea and makes the brew very filling. 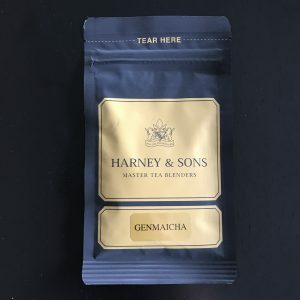 The best Genmaicha I’ve tasted came from Harney and Sons. The short forest green leaves are mixed with little brown dehydrated rice kernels. There are also a few white popped kernels that look like popcorn. The mixture has a bit of a dusty finish to it. You’ll want to steep your tea for three minutes at 175 degrees Fahrenheit. 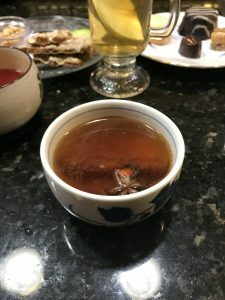 Listen closely as you pour the hot water onto your tea and during the first few moments of steeping, as the rice makes a soft, pleasant crackle and popping sound as it soaks and expands. 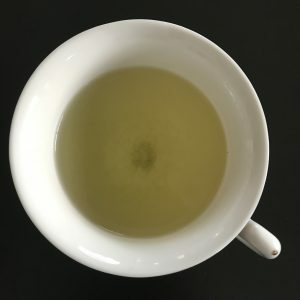 Genmaicha’s liquor is dark green/ yellow and has a hint of cloudiness. The aroma is absolutely delicious. A hint of vegetal, but the resounding scent is reminiscent of toasted popcorn over a fire (side note: popcorn as a snack pairs well with this tea). The flavor, however, is of toasted vegetables. When Lori and I did the official tasting of this tea we tried it two ways. First, as I described above (just tea and water). The resulting brew was light bodied and had very little astringency. The second way we tried this tea was (at Lori’s brilliant suggestion) with the addition of a pinch of salt. As odd as it sounds, adding a pinch of salt (per 6 ounces of water, or your personal preference) to your water isn’t all that unusual. In the classic tea book, The Book of Tea, Kakuzo Okakura suggests salting the water during the “first boil”. Scientifically, adding salt will increase the boiling temperature of the water. I’m sure someone much more knowledgeable than I would be able to step in and explain what that does to our tea leaves. 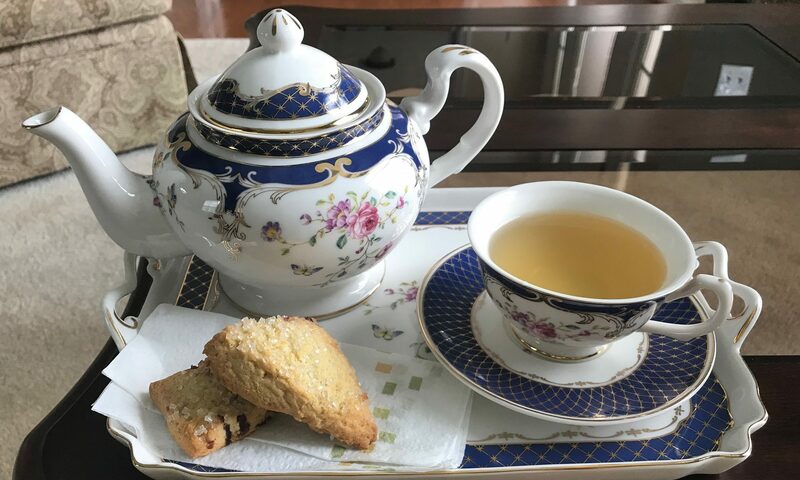 For our purposes today, I can tell you that adding salt not only will enhance the flavor of the tea, but it also will increase the body of the tea. 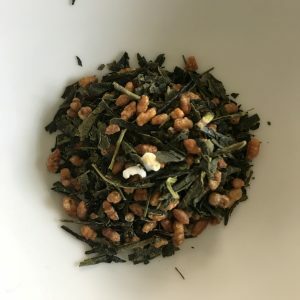 In the case of Genmaicha, the addition of salt makes the resulting brew more broth like and even more filling. It gives your body the feeling of being nourished more than most cups of tea could sufficiently provide. The addition of salt changes this good cup of tea and turns it into an amazing one. For thousands of years salt has been a necessary ingredient in our world. It has even been said that without salt “life cannot be lived humanely” (Pliny the Elder, Roman author and philosopher). Our bodies need it for survival. Our foods need it for texturizing, flavoring, and preservation. Likewise our souls need it. The Bible says “You are the salt of the earth”. We are each here for a reason. God created and ordained for a purpose. And even if you doubt God or your purpose on this planet, know that you are more valuable than mere grains of salt. You add flavor, texture, and depth to this world. Your very presence does more than preserve. It sustains. And you are a desperately needed member of your family and your friend group. This world would not be the same without you. Gratefully yours, my dear tea friend. 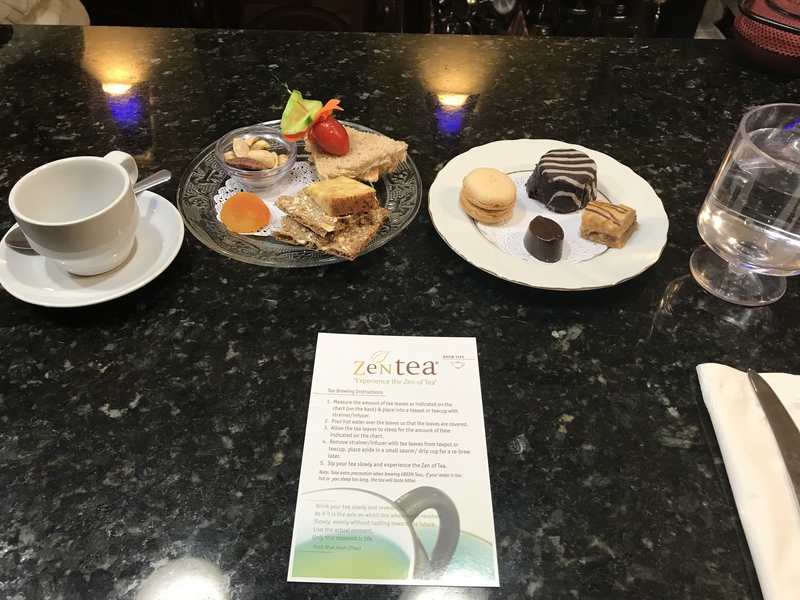 Last week Lori (my tasting partner) and I had the pleasure of taking a wee bit of time off from work and heading to Chamblee, GA to attend the Hot Toddy Class at ZenTea Tea House. We had such a blast! We arrived a good 45 minutes before the class and I’m so glad we did because it gave us time to soak in the serene atmosphere and explore the shop. The selection of teas the owner, Connie, has pulled together is incredible! She has procured a wide selection of common blends and varieties as well as more rare teas. I was in heaven as I walked around her shop. As we waited Connie steeped some tea for us. 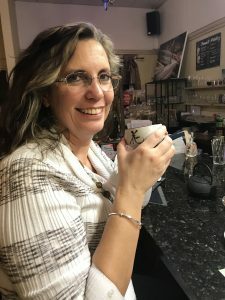 Lori had a pot of Mate Roasted CocoHazelnut while I enjoyed the most glorious Oolong Pouchong. Heavy on the honeysuckle, this tea took me back to days of my youth, playing outside in the hot summer sun sucking honeysuckle nectar right off the vine. After our two other classmates arrived, our Hot Toddy Class began. First, Connie served us a delicious spread with sandwiches, crackers, nuts, and some sweet treats to snack on as she made toddy after toddy for us to taste. It was fascinating experiencing ways to pair different flavors. We smelled every tea before it was brewed and got to sample a few of the teas and the whiskys separately before combining the ingredients. I have never been adventurous in trying new combinations of foods and flavors, so this process is interesting to me. There were several flavors that, when tasted separately, I would have never thought would pair well. However, the concoction that resulted from the blend was delicious. First up in the flight was the most medicinal. 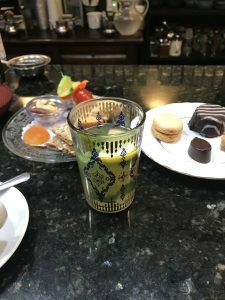 This toddy was made with a tisane of Mint, Lemon, & Ginger with a bit of extra ginger root and mint, fresh lemon juice, a little bit of sugar, and a shot of vodka. High in vitamin C, this toddy was sweet and refreshing. After my first sip I was hooked and drained my cup. Definitely one of my favorites. Second, was Lori’s favorite (and another of my favorites). An amazingly delicious toddy that tasted like liquid joy. 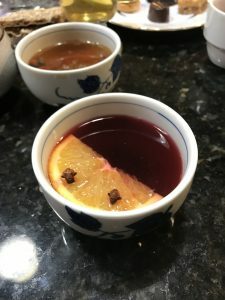 Made with Cranberry Apple tea, apple cider, cranberry juice, and vodka garnished with a clove laden orange slice, it was a soul warming, reminiscent of the cheer of yore, brew. Made with Green Apple Pie tea (a delicious tea on its own), bourbon, brown sugar, and a slice of granny smith apple made for a tart treat with a stout kick. It was a stark contrast to the sweeter first drinks where the vodka seemed to almost disappear among the other flavors. In this toddy, you were definitely reminded of the bourbon’s presence. 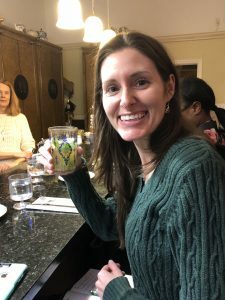 I had heard often of hot buttered rum, but had never tried one until this class. This one was made with a Black Russian Spice tea, a shot of light rum, a wee bit of maple syrup, and a spoonful of a spiced creamed butter. We garnished it with a cinnamon stick and a star of anise. 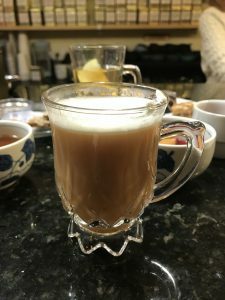 The addition of the butter gave this toddy a very think and filling body, which gave great contrast to the previous drinks that had lighter body. This toddy, with Holiday Spice tea, orange juice, brandy, and agave, was very similar to the Cranberry Apple that we had tried earlier in the evening. Not quite as “cheery” as the former, the addition of the brandy gave this drink a heavier body. Sweeter than the bourbon and rum concoctions of the evening, this drink became another favorite for both Lori and I. Made in the likeness of the Irish Coffee, the Chocolate Whisky with Cream toddy was a delicious treat. The base was Black Connie’s Choice tea with a wee bit of a chocolate flavored Irish whisky. A pinch of sugar and a dollop of whipped cream made this thick, frothy brew. I can definitely see bringing this toddy around to celebrate St. Patty’s Day or any time you need a thick cup to relax. This was also the moment when Lori’s and my tongues decided to differ. The flavor of the whisky was too pungent for Lori’s taste, where as I found it stout, but very grounding and calming. I reckoned that the whisky taps into the highlander blood that runs through my veins. Lastly, in what might have been my most favorite pairing of the evening, the oolong with 12 year old single malt scotch, won my heart. Served separately, this simple toddy had only two ingredients: tea and whisky. No citrus and no sweetener. A lover of oolongs, the Da Hong Pao, with it’s light to medium body, ranges toward the darker side of the oolong spectrum. Alone it was smooth and naturally sweet with an oak-like finish. The scotch, on its own (which happened to be my first sip of scotch), instantly cleared the sinuses, gave a wonderful woody flavor and left a smooth, clean finish. 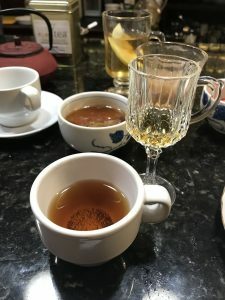 Initially, I thought the two flavors would be too much and the scotch would overpower the more delicate flavors of the oolong. When combined, though, this simple drink was a wonderful melody of a stout and sweet woody flavors; perfect for quiet contemplation. Lori with her favorite cup, the Cranberry Apple. And I with my first ever toddy, the Mint Lemon. This class was a flavorful adventure. We learned a lot, laughed a bunch during the process, and tasted ways to have fun with our tea. 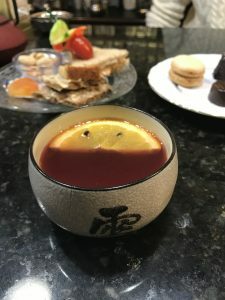 If you’re ever in the Atlanta area, a stop at ZenTea is a must. You’ll get amazing tea, great service, and walk away as friend. And no matter where life takes you, keep exploring tea.